We talk to people who are interested in investing in software to support their continuous improvement efforts every day. Some of them are already using the Lean business methodology, others are just rolling it out, and still others are taking a “Lean light” approach by leveraging some of the principles without adopting all of the techniques. In any case, leaders want to have a good understanding of what to expect and how a Lean management system can help them achieve their goals. Fortunately, we are well positioned to share what our customers have told us happened when they invested in technology to bolster their improvement and waste reduction efforts. An organization’s Lean management system creates a record of all improvement work that is in one unified platform with broad access to managers and employees. Rather than sorting through piles of email and complicated spreadsheets, everyone has just one place to go to report an opportunity for improvement or work on resolving one. All of the relevant documents, images, and other artifacts are stored right with the data about each project. The days of department silos can come to an end. Improvement activities shouldn’t be limited by time or place. By choosing a Lean management system that lives online, you remove obstacles that keep people from entering their ideas or working on projects. Everyone can access the system from anywhere on whatever device they like. 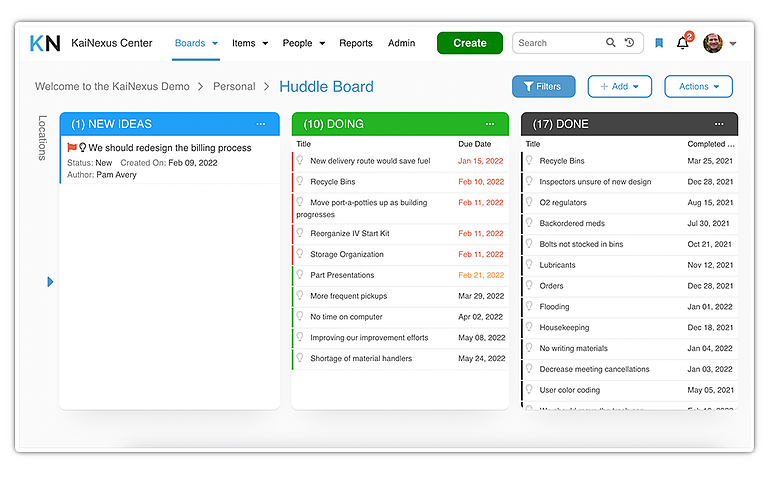 You can digitize your huddle boards making it possible for people to be productive in meetings even if they aren’t standing in front of your boards. In communities and organizations, a common language helps to bind people together. Building a Lean culture requires the ability for everyone to talk about improvement activities and goals using the same vocabulary. Lean management systems help to establish the set of terms that your team will use to discuss change and reinforces that language each time someone logs in. Employees know that what leaders spend money and time on is what they value. If leaders say that something is a priority, yet they don’t fund it, people will know that the commitment to get it done isn’t there. Introducing Lean is a significant initiative. If it is going to be truly transformative, it requires dedication and, yes, investment. Implementing technology to support the effort lets your team know that this isn’t just the philosophy of the week. One of the reasons that we don’t like spreadsheets for Lean management is that they are passive. They only get accessed and used when someone has the thought to do it. Whit a Lean management system, people get alerts and notifications to keep them engaged in improvement activities. When a due date is missed, everyone knows about it so it is easy for supervisors to know when they need to jump in and provide motivation or remove obstacles. Your Lean software creates a storehouse of all the lessons learned across the entire organization. Every past project and relevant document is assembled in one place that anyone can review. That means that an improvement that is started today benefits from the collective wisdom of the organization. People know what has worked well and what didn’t turn out to be very useful. Lean is usually an essential part of an organization’s strategic plan for reaching breakthrough goals and eliminating waste. Leaders can be much more effective if they have information about the health of Lean across the entire organization. Lean management systems create a dashboard that leaders can use to drive the organization to the desired destination. They know which people, departments, locations, and teams are engaged and they have a handle on all of the improvement actives underway. Strategy deployment is an integral part of Lean. It requires that all individual and group goals be aligned with the overall goals and objectives of the organization. Lean technology makes it easy and natural to cascade goals down from the C-suite all the way to the front-line employees. Improvement work is tied back to the strategy and setting priorities becomes straightforward. Even though I am listing this one last, it is probably one of the biggest benefits of Lean software. If you choose a solution with robust impact reporting, you will be able to calculate the impact of each improvement in terms of one-time and ongoing results. Did your Lean efforts save money, improve customer satisfaction, raise the level of quality, get products to market quicker? With a Lean management system, you will know precisely how Lean changed your most important business metrics. Every other important function in your organization likely has technology to support it. Our customers have found that supporting Lean is no different. There’s no reason not to put your team in the best possible position to succeed.